No matter what time your pizza craving hits, Columbia’s plethora of pizzerias will satisfy your appetite. Old and new, each of these locally owned restaurants puts an emphasis on crafting pizzas that are palate-pleasing for every member of your family or group of friends. Whether you’re looking to snag a quick slice or want to chow down on a whole pizza pie, this pizzeria key will help you find a mouthwatering destination. 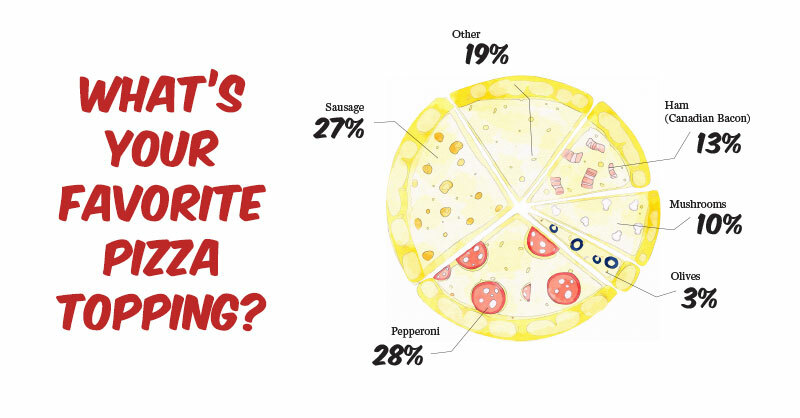 You’ll also find the results of our pizza poll sprinkled throughout. Manzo’s wood fired pizza is turning up the heat — and doing so on the go. The wood fired oven can bake pizza in under five minutes, meaning that the truck is not only built for mobility, but also for speed. The menu features five pizza choices, including the classic The Manzo, topped with red sauce, pepperoni, ham, sausage, mushrooms, black olives, onions, and for a little extra heat, jalapeños. If you’re looking for something a bit different, try the Royal Bleu, a pizza topped with white sauce, bacon, bleu cheese, mozzarella, Parmesan and roasted onions. Or if you want to branch out even further, taste a Manzoni, the truck’s spin on a calzone, or the immensely popular Voodoo wings. Keep an eye on Manzo’s Facebook page to see where you can find them to get your fill. Hours: Monday – Saturday 11 a.m. to 10 p.m., Sunday 11 a.m. to 9 p.m.
Arris Pardalos opened the original Arris’ Pizza across from Missouri’s Capitol building in Jefferson City in 1961, adding a family-friendly gathering place to the city’s restaurant scene. More than four decades later, Columbia became a new home for the much-loved pizza parlor, serving up pizza, pasta and more in its family style bistro. The popular Hercules lives up to its name in size and toppings, loaded with seasoned ground beef, Canadian bacon, pepperoni, Greek sausage and breakfast bacon. 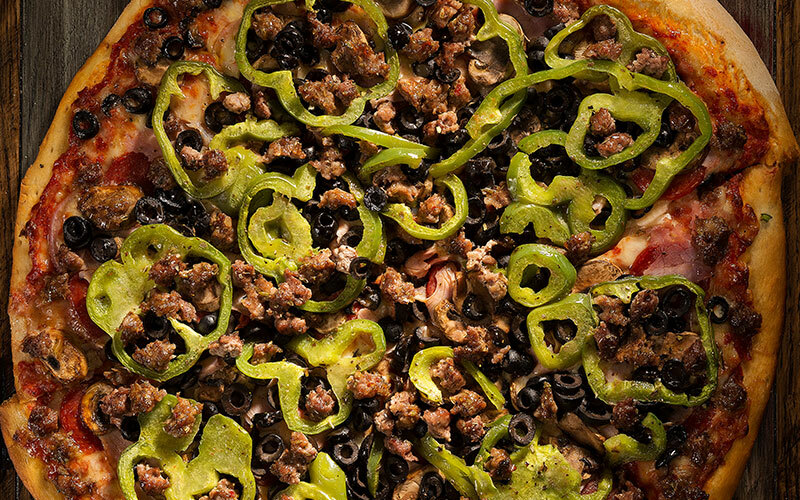 The Arris is another popular pick among customers, and is topped with Greek sausage, onions and green peppers. Pick up a slice of pizza Tuesday through Friday during lunch. Hours: Monday – Saturday 11 a.m. to 10 p.m. Families flock to G&D Pizzeria for the food and for the atmosphere. The restaurant has been owned and operated by Pano Terzopoulos and his family since it opened nearly 50 years ago, with the prerogative to make sure every member of your family finds something to their liking on the menu. Here, toppings such as the house-made sausage, burger, and fresh peppers fall onto scratch-made crust to create a delicious Greek-style pizza. If pizza isn’t everyone’s favorite, steaks, burgers and even gyros are on the menu. The Terzopulous family’s strong embrace of food tradition means that you can always count on the pizza to be consistantly delicious each time you visit. Location: McNally’s Irish Pub, 7 N. Sixth St. Hours: Monday – Tuesday 4 p.m. to 2:01 a.m., Wednesday – Thursday 4 p.m. to 3:01 a.m., Friday – Saturday 11 a.m. to 3:01 a.m., Sunday 11 a.m. to 2:01 a.m.
They’ll tell you themselves — they are open way too late. But, when 2 a.m. rolls around and a craving for hot fresh pizza hits, we sure are grateful for those late-night delivery drivers. Wise Guys caters to nocturnal pizza-lovers with its delivery hours, bringing pizzas ‘round until 3 a.m. on weekends. Whether you’re up because the party is over but your hunger is lingering or because the baby’s been crying for hours, Wise Guys has got your back. Order a Chicago-style deep dish, stuffed crust or traditional crust, they won’t disappoint. Hours: Sunday – Thursday 11 a.m. to 9 p.m., Friday – Saturday 11 a.m. to 10 p.m.
One of the newest additions to Columbia’s assortment of pizzerias, West Main2 is also one of the quickest. The one-size-fits-all philosophy also comes with a one-price-fits-all system. The traditional crust pizzas (gluten crust) are $9, and come baked to order in around 5 minutes, loaded with your choice of fresh ingredients. It’s the option to embrace individuality with a variety of toppings and sauces all at one static price that customers enjoy most. Those with food sensitivities can find something that works for them too. A gluten free crust is available for $10, and cauliflower crust comes at $14. Pair your pizza with a soft drink for just a dollar more, or choose from a selection of beers on draft. Hours: Monday – Thursday 11 a.m. to 11 p.m., Friday 11 a.m. to 12 a.m., Saturday 4 p.m. to 12 a.m., Sunday 4 p.m. to 9 p.m.
Tony’s has been a Columbia favorite since the Veros family opened the shop downtown nearly half a century ago. Today the pizza palace still serves up thin crust pizzas seven days a week, along with other specialties like baklava and gyros. Meet with colleagues for lunch, stop in for a carryout order on the way home for dinner, or call in to order for delivery. Owner of Angelo’s Pizza and Steak, Pano Skyvalidas, taste-tests pizza just like many of us do. He puts leftovers in the fridge, and waits until morning. “That’s how I determine if pizza is good or not,” he says. “If you can eat it right out of the fridge and it’s still just as good, that’s a good pizza.” Pano has been serving up his next-day-delicious (it’s also just as good right out of the oven) pizza at his family’s restaurant for 32 of the 50 years Angelo’s has been operating. Along with the homemade crust, sausage, and fresh ingredients, Pano says customers love the family-friendly atmosphere and affordable prices. Hours: Downtown: Monday – Wednesday 11 a.m. to 2 a.m., Thursday – Saturday 11 a.m. to 3 a.m., Sunday 11 a.m. to 1 a.m.; RF Parkway: Monday – Tuesday 11 a.m. to 11:30 p.m., Wednesday – Thursday 11 a.m. to 12:30 a.m., Friday & Saturday 11 a.m. to 2 a.m., Sunday noon to 10:30 p.m.
For many current and former college students in Columbia, Gumby’s was present in many late night memories. The pizzeria’s late-night dining room hours and delivery options make it a popular spot for those who crave an extra meal between dinner and breakfast. And those memories bring people back to Gumby’s years later, putting in the same late-night order — maybe just a little earlier in the night this time. 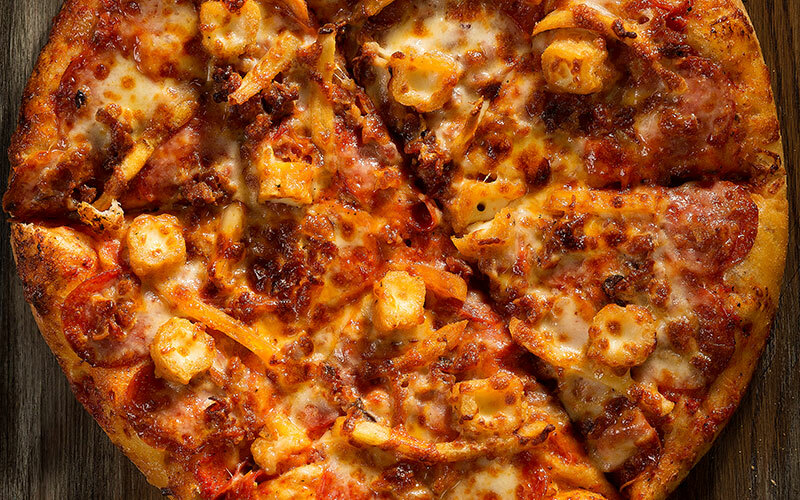 Columbia favorites are the Uncle Jesse, a pizza topped with alfredo sauce, chicken, bacon and pepper jack cheese, along with The Stoner Pie, topped with pepperoni, bacon, mozzarella sticks, french fries, cheddar cheese and topped with mozzarella. And you can’t forget to add Pokey Stix to your order — Gumby’s famous garlic cheese bread. Location: South: 3911 Peachtree Drive; Downtown: 225 S. 9th Street; West: 3304 W. Broadway Business Park Ct. Hours: Saturday – Thursday 11 a.m. – 10 p.m., Friday and Saturday 11 a.m. – 11 p.m., bars open Monday – Saturday 4:30 p.m. – 1 a.m., Sunday 4:30 – 11:30 p.m.
What do Columbians love about Shakespeare’s? There’s a pretty simple answer. In the words of Shakespeareans themselves, “It’s the pizza, stupid.” And it’s true; it really is that simple. 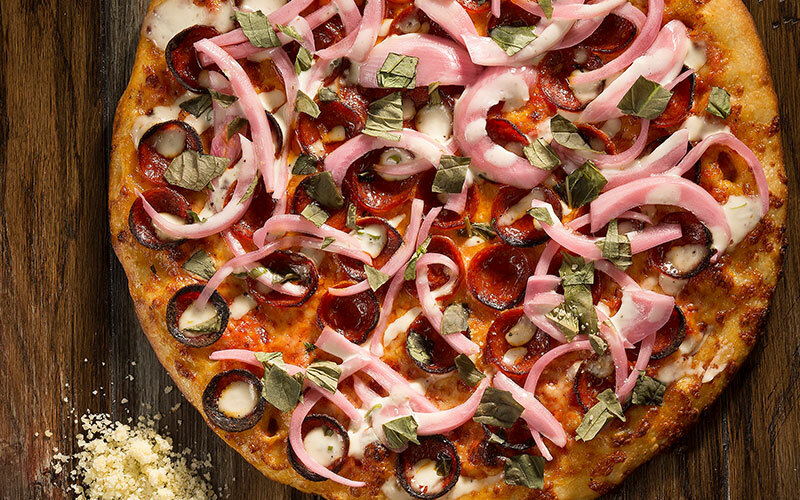 There’s something about a Shakes’ pizza that’s delightfully dependable and delicious. 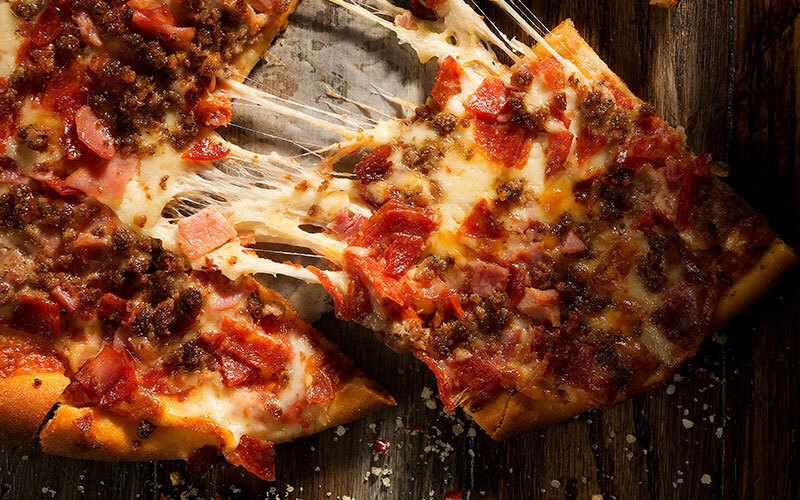 Classic orders include the Meat Lover’s, topped with over a pound (on a large pizza) of pepperoni, Canadian bacon, ground beef, Italian sausage and breakfast bacon. If you want veggies to make an appearance, try the popular Masterpiece, topped with red onions, pepperoni, Canadian bacon, fresh mushrooms, black olives, green peppers, Italian sausage and lean ground beef. As for the restaurant itself, it’s a combination of nostalgia and quirks that combine to make Shakespeares a much-loved Columbia eatery. Go with your parents, kids, friends or your boss and have a good time — and a good pizza — every time. Hours: Sunday – Thursday 11 a.m. to 10 p.m., Friday – Saturday 11 a.m. to 11 p.m.
Italian Village pizza has been a hit with Columbians for 20 years. In fact, it’s outgrown its single location on the North side of town and plans to open a second location in the Broadway shopping center near Gerbes this fall. It is one of the only locations that will deliver anywhere in Boone County, spreading that taste of Italy well outside city limits. Customers love the homemade garlic crust, fresh ingredients, and most of all, great customer service, says co-owner Richard Martin. He and his brothers, also co-owners, plan to keep the family tradition going for years to come. Hours: Sunday – Wednesday 11 a.m. to 10 p.m., Thursday – Saturday 11 a.m. to 2 a.m. Whether you’re craving a whole pizza pie or just a slice, Pizza Tree has you covered well into the night. Venture into the Treehouse, as the owners like to call it, to order a pizza that’s just as unique as you are. Owners John Gilbreth and Amanda Rainey find inspiration outside the pizza box, whipping up specialties like the Jalapeño Papa, inspired by jalapeño poppers, Carne Asada, Mexican pie with corn sauce, and Spin Art, featuring spinach artichoke. But the most popular item is probably the simplest — a slice of pepperoni. That’s quite possibly because each ingredient is selected and treated with care, no matter how small or simple, says co-owner Amanda. “We get a lot of comments about how good our dough/crust tastes, and that is because we use high quality flour, a sourdough starter, olive oil and honey for extra flavor and quality,” she says. “We make all of our sauces and salad dressings, we season and roast our mushrooms before they become a topping, and we make our Italian sausage and Canadian bacon with Patchwork Farms pork.” Drop by or call for delivery to snag a slice.